Sorry for the long delay without any forewarning. Life caught up to us; between holidays, birthdays, finals, shoppings, and celebration we haven’t had any chance to write! Don’t worry, we are back to start off the new year writing once more. Endgame content is arguable one of the most important aspects of World of Warcraft. The majority of our playtime is spent at max level so there is a huge need for long term max level content. As with all expansions, WoD brought in new max level content. The current debate is, is this enough? Fussypants: In my mind, there are two types of max level content: PvP and PvE. 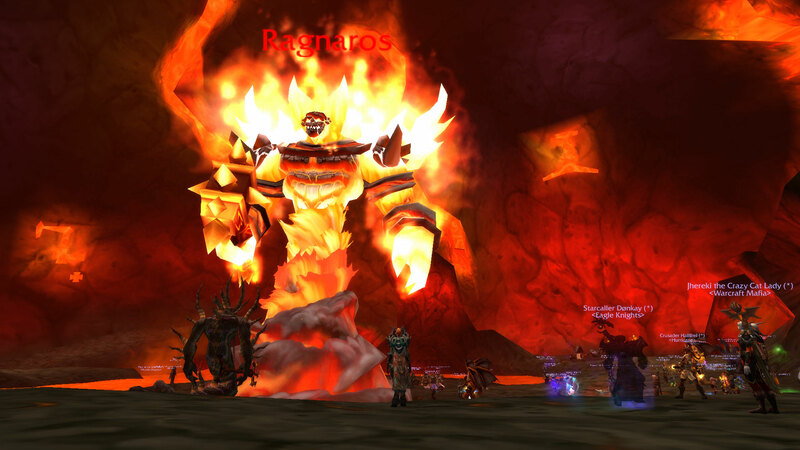 On the PvE front, we have garrisons, raids, dungeons, and reputations. On the PvP front, we have battlegrounds, arenas, skirmishes, and Ashran. Now I’m no die hard PvPer, so my knowledge is more limited for that, but I would say the PvP front is pretty well covered. The main content issue seems to be with PvE content. I think that the lack of an overwhelming number of dailies has created the notion of less content. Minute for minute, I will agree that there is less to do. However the content we have is much more enjoyable and much more lasting. I will be the first to admit- I hated dailies. I did very few of them and only when I really had to. Because I couldn’t log on every day for two hours to clear out all the dailies, I always felt behind and annoyed. So consequently, I barely did any dailies and I have very few Pandaria reps at Exalted. With WoD, that two hour glut of dailies has been replaced with a twenty minute garrison jaunt. Chores are chores, and checking my garrison isn’t the most entertaining thing. But I’m liking it so much more than the MoP chores. I can leave my garrison alone for a few days and I won’t fall behind. Also the time commitment is WAY less, so I feel motivation to check my garrison almost daily. Garrisons allow me to do more with my playtime because I spend less time completing chores. I will definitely agree that garrisons aren’t perfect (cough cough professions cough), but they are a much more enjoyable form of content. And if they are more enjoyable, they are more lasting. As a dps facing long queues, I do miss the quickness of scenarios. 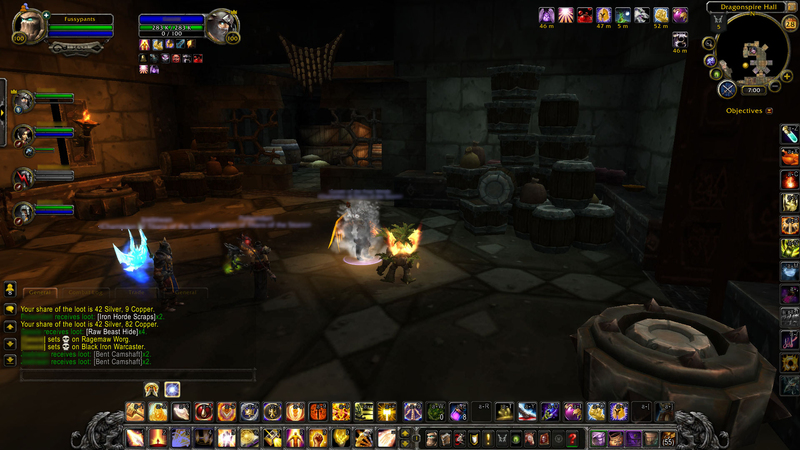 Dungeons are about an hours wait and raids can be even longer. But the number and variety of instances are something I would not give up. With the added bonus of Inn quests, dungeons are unique and challenging (less so than the start because of raiding gear, but not a snoozefest). The only dungeon I dislike is Everbloom, not because of mechanics or boss fights, but because I find the story really creepy. My experience raiding has been limited thus far, but I have found Highmaul to be an entertaining raid. Molten Core though, that can die in a fire. I think the biggest problem is there are no dailies with reputations locked behind them. I think dailies were a bigger amount of content than people realized, and without them it can seem like there is very little to do. I have yet to run out of things to do, so personally I think this expansion is better for it. In the PvP field, let me just say that I think its the best thing that Blizzard could have done. I, I of all people have began seriously getting into PvP. For realsies. I’m saying this with a straight face. I absolutely love Ashran. You can go get the bad guys in a massive brawl or go off and do side quests or just collect artifact fragments. Almost any playstyle still supports your team so you can pretty much do whatever you want. Plus, the gear that drops both in Ashran and from battlegrounds is a huge incentive to go out and PvP. I love that stunned till death is no longer the fate of noobs like me, and that even as an undergeared boomkin, I can still help my team. I might be the only person to think this, but I really do love the Southshore Anniversary Battleground. Not for nostalgia’s sake (I actually never participated in the original incarnation) but because it was an awesome free for all brawl with no objectives other than destroying the enemy. I haven’t dabbled into any rated PvP, but the non rated PvP I have done thus far has been awesome. My only wish is that Ashran didn’t have super long queues. If you can’t tell, I’m totally enamored with this expansion. I’m discovering new passions and enjoying every minute of my playtime. The content we have is just fine in my mind! I haven’t leveled Yotaan beyond Shadowmoon Valley. I actually spent most of my time playing on my Forsaken Rogue and got him to level 100. I’ve missed the Horde it seems. As for endgame PVE, my experience has been very limited, With the rogue I reached level cap in Spires of Arak and then went into PVP. I didn’t even go into Nagrand, my idea being that I will save it for Yotaan to experience it fresh. So, while I have done a bunch of Garrison stuff (and boy was I lucky with followers – most of them were epic right from the start), I haven’t done any dungeons or raids. I’m not even sure if I want to, at least on this toon. On the other hand, I have always enjoyed PVP and never had a max level rogue in it. 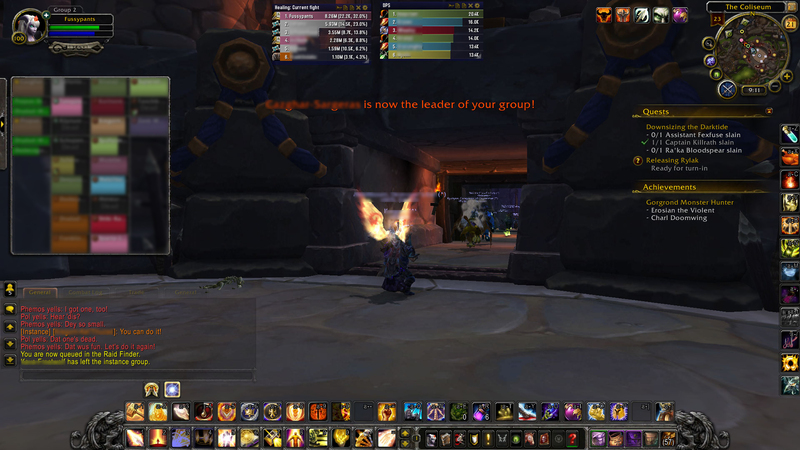 Ashran is very good but has been a challenge. It is not friendly to squishy melee, particularly in those big brawls. I can see why Fussypants likes it, shooting her moonbeams in the back! I’ve tried the anniversary PVP BG as well, but they have been poor groups, we lost every time. Once I learn my rogue better, I will be able to help more. There is definitely plenty to do in the endgame. I don’t miss dailies at all, but now I don’t understand the point of reputations either. Plus, there are more zones to open down the road, so I do think there is plenty to do now and in the future. You knew it was coming. The inevitable. The inescapable. The healing article for Warlords. As you probably already guessed, I’ve been doing a lot of healing recently. Up until two days ago, I was the only healer in our guild at max level. So I was healing just about every dungeon we ran. My gear is far from great due to my forever terrible loot drops, so for the majority of my healing I was around 600 ilvl. And because of this, I have only healed normals. My first reaction to healing, is that is hard. A lot harder than it ever was in Pandaria, even in the beginning (I started healing in MoP, so I’m not sure how hard it was compared to earlier expansions). There’s a lot more button mashing frantic spamming than I remembered. However, I noticed five big things with healing, that both made it harder and easier. Maybe this was just me and I’ve mastered my pally this well, but there were a lot less deaths. Near death accidents? Oh plenty. But full on deaths? Not as common. A combination of a decrease in spike damage and my Lay on Hands spell seems to help prevent the issue. I have the time to react and throw out an appropriate heal. Death isn’t as sudden and unavoidable as it once was. And this I really, really like. I feel like I’m getting the chance to make a difference. If someone screws up on mechanics, there is now a small window of time where I can save them. I’m liking this less death thing. I’ve definitely noticed this one; there is less spike damage. No longer does the tank drop from 100% to 25% within a second. Damage is steady and predicable. But I’m not saying there is less damage, in fact I’d argue there’s more. Damage is high but steady and sometimes heals alone cannot power through it. There have been plenty of bosses where my heals simply could not spam through the damage and I have to pop some sort of cooldown. My Gift of the Naaru has gotten quite a lot of use this past couple of weeks. It takes more cooldown mastery instead of blink luck to keep people alive now. I’m liking the less spike damage, but managing all my cooldowns can be stressful. So I’d say this one’s in the middle for me. 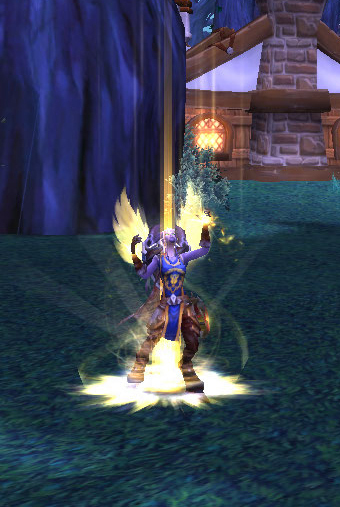 In Mists, popping a healing cooldown on my paladin was a little boost to my healing but more meter padding. I could feel a little increase in power, but not much. Not now. Now, when I pop my cooldown, its like I’m unleashing my inner angel of healing. I grow larger, get freakin’ wings, and can heal like a beast. For that brief space in time, nothing can kill my party members. A couple of my AoEs and they are at full health. Cooldowns are last resort, super charged moments of awesomeness. And I absolutely love it! But this is a double edged sword. Sure, I have a button of awesomeness, but it has a three minute cooldown. And I only have one button of awesomeness. It’s really my last resort button because if I push it too early, we all can die later when I truly need it. I have to say, I’m really digging this new powerful single cooldown thing! I think I’ve only gone oom mid fight twice out of dozens of boss fights. All my single target heals barely cost any mana. Even when I spam Flash of Light on a tank, I don’t lose too much of that blue bar. What really drains my mana is when I cast my AoE over and over again. That’s when I go oom, and when everything falls to pieces. This mana cost has effectively gotten rid of AoE mashing for a whole fight. I will admit, it definitely took some getting used to after the AoE spamfest that was SoO. But its admittedly more fun. You gotta plan which heal to use instead of AoEing for all damage. Sure, you still can AoE and it still will heal up everything but then you run out of mana. And with spirit and mana regen spells gone, then you are kinda screwed. You gotta know your spells and know your cooldowns. I am really really liking this change! There are some fights that are extremely movement heavy. As a healer, I sometimes have to move constantly. And with the decreased amount of instant casts, this is somewhat of a problem. I often can’t stop to shoot off a heal, because if I do I’ll be dead or falling off something. But if I don’t shoot off a heal, my party members will die. It’s this wicked struggles, and I haven’t quite figured out the trick. My fights with the most wipes are the ones with the most movement. Ner’zhul and That Guy On The Train come to mind right away as some of my least favorite fights because of this. Perhaps, as my gear improves and my one instant cast spell gets more powerful this will be less of a problem, but right now I’m struggling. This change is not my favorite. All in all, healing seems to have moved to become more cooldown and spell mastery than spirit stacking and AoEing. And, even though its a lot harder I’m liking it more. No, this is not me being elitist (I am far too lazy and goof off too much 😛 ) but me knowing what is best for me as a healer. This new style of healing has kept me on my toes. I’m relearning cooldowns and honing my reaction times. I’m becoming a better healer and overcoming the difficulties. Also as a side note, Proving Grounds Silver for heals, a total snooze-fest! I was able to two shot it (the first time failing due to a buggy mechanic) without busting out any cooldowns. I will have to go back and try out gold, but that was super easy! And a pretty bad preparation for dungeons unfortunately. This has all been from the perspective of a holy paladin, so other healing specs might find they have different experiences. I have not gotten the chance to level my druid or priest, so I’m going from this one view. What has been your experiences with healing of any class?